1. Make sure that you have the necessary rights to modify the palette list. If you do not, select Edit > Edit Palette List Mode, a check mark will appear beside the command to indicate that the mode is enabled. 2. In the Timeline or Xsheet view, select the drawing that requires a palette. 3. In the Colour view, click on the Show Palette List View button to display the palette list. 4. In the Colour view, click on the Menu button and select Palettes > Link or click on the Link Palette button. The Palette Browser: Link Palette dialog box opens. 5. Select the location and level where the palette file is stored. When a level is selected, the palettes it contains are displayed in the Palette field. The Scene Palette List is mainly used with cut-out animation. A cut-out character will often be divided in twenty to thirty different drawing elements that use the character's master palette. The palette list is stored at the scene level instead of the Element directory. This way, all palettes linked to this list will appear in every drawing element created in the scene. There is no need to manually load the palette in each element. The Element Palette List is mainly used with traditional and paperless animation. Unlike cut-out animation, all columns (drawing elements) contain different characters, props, backgrounds and effects. The Element Palette List is used because you do not necessarily want all of the palettes for all of your elements linked in every column. The palette list is stored in the drawing element's directory instead of directly in the Scene level. This ensures that the links to the palettes appear only in the appropriate element. 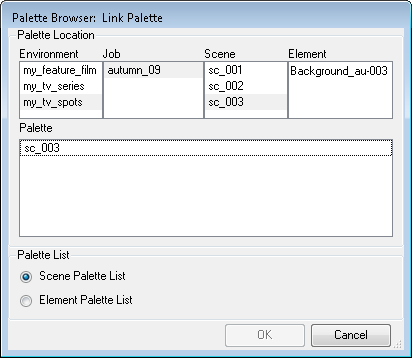 If you prefer to access a global palette list, link your palettes to the Scene Palette List. The palette appears in the drawing element's palette list.